"Chmielewski Funtime Variety Show Band"
The Chmielewski Funtime Band has had their own television show, has appeared on shows throughout the nation, and been inducted into the Minnesota Music Hall of Fame. These talented musicians are part of a family whose current members are the fourth generation of Chmielewskis to perform in this band. 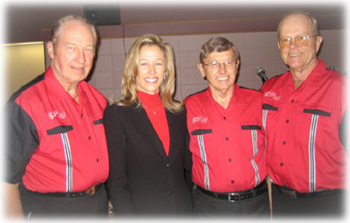 Since 1882, the Chmielewski family has been synonymous with accordion music. 1994, and into Ironworld Discovery Center Polka Hall of Fame (Chisholm, MN) in 1995.
leadership in 1945. They have produced more than 40 albums, cassettes, and videos. dedicated proponent for the special concerns of northern Minnesota. Our Feature Entertainers have thrilled visitors to Folklore Festival at the Fort William Gardens in Thunder Bay, Ontario. 2008 ENTERTAINMENT SCHEDULE ONLINE. Click here. See "Chmielewski Funtime Variety Show Band" on stage May 3rd!